July 4th Craft Ideas ~ Inspired by turn-of-the-century celebrations, these seven joyful tributes to red, white, and blue harken to a time when impromptu hats were folded from leftover newspapers, and marching bands, firecrackers, and lawn games marked the day. Adapt the rosettes for this banner to any size.Step 1: From blue crepe paper, cut a strip 8 inches wide and 20 inches long.Step 2: From a clean newspaper, cut a narrower strip of paper. Lay it down in the center of the blue strip, gluing in place. Repeat, cutting an even narrower strip of red crepe paper, then gluing in place.Step 3: Fan-fold across the narrow width of the strip. Fold in half lengthwise.Step 4: Open out on either side of the center fold you just made to create a circle; glue. Print "Happy Fourth"; cut out around the letters in a circle with pinking shears. Glue onto rosettes.Step 5: Cut 8-inch pipe cleaners in half. Use one to form a loop; slip through another to form another loop, and so on. When chain is complete, glue a pipe cleaner loop to the back of each rosette, first passing it through a chain loop, then gluing in place. The look here was inspired by crepe paper found at a flea market, then reworked to create chair decorations that resemble old-world ribbons. 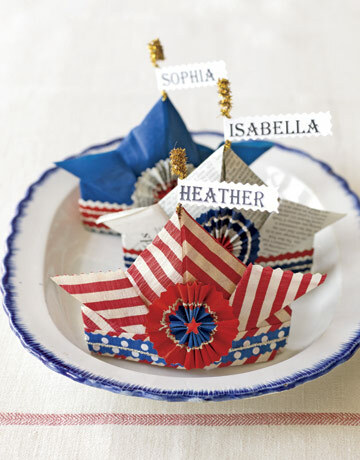 Learn to fold these charming paper-hat place cards, then add colorful bands, rosettes, and toppers. Make a sparkling hat topper by coiling a metallic pipe cleaner around a pencil, then carefully inserting the pipe cleaner into the top of the hat. Print or hand-stamp a name banner and trim with pinking shears. Fold hats using newspaper or red, white, and blue crepe paper. Look for striped and dotted paper, too. 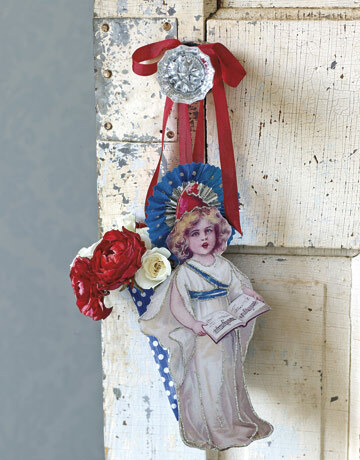 The Lady Liberty door hanger can be filled with fresh flowers, stick candy, or lollipops. A simple crepe paper pocket is glued to the back of a printout of Lady Liberty on heavy paper. 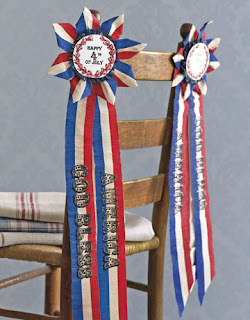 Embellish with a rosette; hand tie with ribbon. Carnation balls are a fresh take on a humble flower. 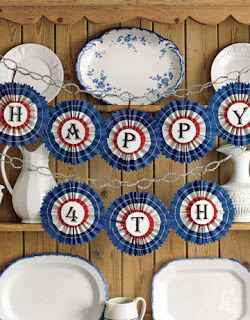 They add a fun burst of color to your Fourth of July table, and they're easy to make.Step 1: Thoroughly saturate a 3-inch sphere of floral foam with cool water.Step 2: insert short carnation stems — cut to an inch below the calyx — in a concentric, coiling pattern until the sphere is almost covered. 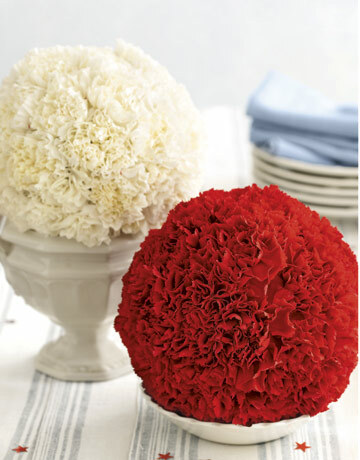 Each of these spheres holds about 50 carnations.Step 3: Display carnation balls individually, or cluster balls of varying sizes — and color — on a favorite vase or tray to create a distinctive and dramatic centerpiece.Step 4: Place sphere with its "bald spot" in a saucer of cool water; refresh daily and it will last a week. 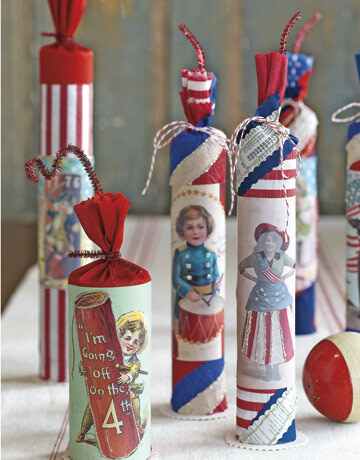 Guests will get a bang out of these "firecracker" favors, which can be filled with sparklers.Step 1: Wrap paper towel tubes with crepe paper and printouts of Victorian postcards.Step 2: Add favor, then hot-glue a cardboard circle to the tube's bottom.Step 3: Insert a pipe cleaner "wick"; tie off. weblog's posts everyday along with a cup of coffee.